Gambling is probably so appealing to beginners because it's very easy to get started. Although there's a lot to discover about gambling, you can learn most of it as you go along. As long as you have a basic understanding, you can start to enjoy most forms of betting and gaming with the potential to win a significant amount of money while doing so. With that being said, even as a complete beginner you should already be thinking carefully about certain things. You can worry about the complexities of strategy and the various ways to improve your chances of winning later, but you do need to focus on gambling in the right way in order to have the best possible experience. Smart gambling is habit forming, and if you get into good habits from the moment you start you'll get much more out of your gambling experience in the long run. It doesn't matter whether your goal is to make money consistently, minimize your losses, or simply have as much fun as you can. What does matter is that you have the right mindset and approach when gambling. If you can stick to a few simple rules, then you'll be off to a great start. These rules will eventually become second nature to you and you won't have to worry about remembering them. When this happens, you'll be able to focus on achieving whatever it is you want to achieve from gambling. The rules you should follow are set out below, in the form of a list of dos and don'ts. Most of these dos and don'ts are self-explanatory, but further down the page we explain each one in a bit more detail. Please take the time to read through this page, and please try to take the advice we offer. We're confident you'll be glad you did. This is the number one "do" on our list for a reason. It's a simple fact that you are always at risk of losing money when gambling, no matter how good you are. This doesn't mean you always will lose of course, just that there's always a chance. We believe you should always be prepared to lose, as it makes coping with a loss much more bearable and winning that much more enjoyable. This was a close second on our list, as it really is very important. You should always set aside a certain amount of money that you are prepared to spend on gambling, and then make sure that you don't spend over that amount. Giving yourself a fixed budget will help prevent you from gambling more than you can afford to lose, and it will teach you to be disciplined. Discipline is extremely useful when gambling, particularly if you have any desire to become a consistent winner. As well as controlling how much you can spend, a fixed budget (referred to as a bankroll in gambling terms) should also determine how much you stake. If you don't use appropriate stakes, your money won't last very long. If you sit down at a blackjack table with a $500 bankroll and start playing $100 a hand, you could be standing up again in five hands time. If you play at just $10 a hand instead, you'll get plenty of playing time and probably more opportunities for a winning streak too. The idea behind using appropriate stakes is basically to make sure that bad luck doesn't bust your bankroll too quickly. Although losing the first five blackjack hands you play would be pretty bad luck, it could easily happen. You want to be able to cope with losing streaks without depleting your bankroll, as there's always a chance that your luck will turn around if you use your money in the right way. Keeping records of your gambling outcomes is a great habit to get into, as it reaps many benefits. First and foremost, it can help you keep track of your losses so that you can identify whether or not you're overspending. If you bet on different sports, or play different casino games, it can also help you analyze where you win or lose the most. This will help you see where you get the best value for your money. If you have ambitions of being a successful poker player or sports bettor, then keeping accurate records will be essential. That's precisely why you want to get into the habit of doing so as a beginner. An unfortunate habit of many gamblers is to go a bit crazy after a big win. This can involve betting more than usual, taking bigger risks, or just being generally reckless. This invariably results in the loss of all of their winnings very quickly, and it's something you need to avoid doing yourself. If you have a good win, then by all means use some of your winnings to increase the size of your bankroll, but set some aside for yourself too. It doesn't matter exactly what you do with that money; just make sure it doesn't go straight back to a bookmaker or a casino. Try and spend it wisely, as you never know how long it could be until your next big win. You should always be trying to improve your gambling knowledge, regardless of your reasons for gambling. It's vital if you want to become a consistent winner, and it's beneficial even if you're just gambling for fun. The more you know, the more likely you are to make good decisions. Better decisions equal better chances of winning money. At the very least, they'll help you stretch your money further. There are lots of tools you can use to learn more about gambling. 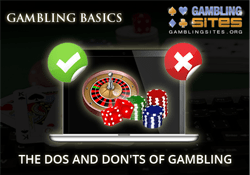 This website alone is absolutely packed with information and advice on the subject, and there are plenty of other sites on the web that cover various gambling related topics too. There are also hundreds of books about gambling available, so there's really no excuse for not improving your knowledge. This "don't" is very straightforward. Gambling can be a very expensive habit if you don't manage it properly, so you need to be diligent about doing so. The exact amount of money you spend on gambling doesn't matter, as everyone's financial circumstances are different, but you should never spend more than you can afford to lose. The moment you start risking money that you can't afford to lose is the moment gambling stops being enjoyable and starts becoming a problem. Regardless of how likely you think you are to win, you are ALWAYS taking a risk when gambling. If you lose money you need for something else, that could lead to all kinds of difficulties. In a worst case scenario you might start risking even more to try and win it back and that's when things can get completely out of control. The whole point of setting a fixed budget is to prevent this from happening. So please follow our advice and make that budget. More importantly, though, make sure you faithfully stick to it. Chasing losses is one of the cardinal sins of gambling, and it's something you should avoid doing altogether. If you're not familiar with the term, chasing losses is the act of increasing your stakes to try and recover previous losses. We've just mentioned how you shouldn't spend more than you can afford, and this point is along similar lines. Chasing losses even when you can afford to is still a bad idea, as you're just going to end up losing money more quickly. If you're on a losing streak, there are only three sensible courses of action. The first one is to simply take a break and save whatever money you might have left for another time. The second one is to keep playing or betting, providing you have enough bankroll left, while reducing your stakes. Your luck might turn around, but if it doesn't at least you'll make your money last longer. Your third option is to keep going at the same stakes. This is probably the least sensible option, but it does have its merits if you are still gambling within your bankroll. If your luck turns around quickly, you may be able to start recovering some of your losses. That's not really the right way to view things though. Once you've lost your money it's gone, and you shouldn't really be thinking in terms of winning it back at all. You should accept the loss and move on. You should also remember that a losing streak can go on for a very long time. That's why taking a break or reducing your stakes are the preferable options. Gambling when drunk should definitely be avoided. Regardless of what your reasons for gambling are, to get the best possible experience you'll need to make good decisions. Good decisions are usually hard to come by when you are drunk, and the same is also true when you are stressed or upset. If you aren't in the right frame of mind to think clearly and rationally, then you really shouldn't be gambling at all. There are better ways to cheer yourself up. The last thing you want is for gambling to become some form of emotional release. That's one way that problem gambling starts. Risk is an accepted part of gambling, and it could be argued that all gambling is an unnecessary risk, but that's a discussion for another time. The point we're trying to make here is that you should manage the level of risk you take. You shouldn't go making crazy bets or staking huge amounts to try and score a big payout. You might get lucky every now and then, but chances are you'll end up losing your money more quickly than you hoped. Successful gambling, regardless of what you're trying to achieve, ultimately requires you to stay in control. That means avoiding reckless gambling or taking unnecessarily high risks. Gambling when you don't know the rules is a bad idea, and it rarely ends well. Playing a casino game you don't really understand, for example, is more than likely to cost you money. The same is true for playing a form of poker you aren't familiar with. A similar principle applies to betting on sports that you don't really understand or follow that closely. There's absolutely nothing wrong with trying out new forms of gambling, but you really should make sure you know what you're doing first. There are no circumstances in which borrowing money to gamble with is a good idea. If you don't have the money to do it, then you shouldn't be doing it. Even if you are exceptionally confident you are going to win, it's just not a good idea. We've made the point before, but we'll make it again, there's always a risk of losing with gambling. Losing money you can afford to lose is one thing, but losing borrowed money is something else entirely. You might argue that it's ok to borrow money if you know you can pay it back soon even if you lose, but that really is no justification at all. If you're expecting money soon, then surely you can wait until you have it on hand. If you are that desperate to gamble, you shouldn't be gambling at all.